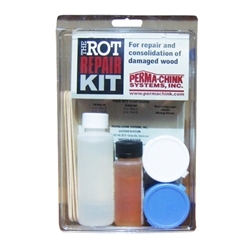 Epoxy wood rot repair kit Includes enough M-Balm and E-Wood for small repairs. Good product! I purchased the Epoxy Kit to try the products and was able to get an idea of how it would work, but the kit did not cover much area. I will be repairing and filling in a fairly large rot area in one of my logs soon, so I will consider purchasing the bigger quantities. I used this kit on a small area on the side of my pine log home. After that area of wood was treated, I applied M-Balm into the wood cavity first and pushed the E-Wood putty on top of the M-Balm. After the putty hardened, I sanded it down to make it even with the surface of the log and I plan on staining over it next to match the logs better. This kit would be best for only small areas on wood.